So you thought Bunny Vs Monkey was a high-octane nutfest of utter lunacy, but Jamie Smart was clearly using that to ease us in and prepare us for the freaky feline madness of Looshkin. 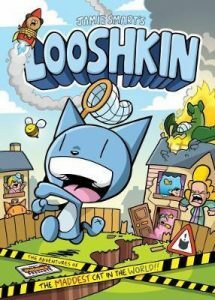 Once upon a time only cat owners would know the true strangeness of their own cats, but the wonder of the internet reveals that most cats are little screwy, and as this book proves, Looshkin is the screwiest of them all. Operating on his own personal wavelength of reality, Looshkin is a danger to all around him as he recklessly orders pigs over the phone, battles clowns and opens portals to a hideous dimension of further Looshkin madness. Possessing a beguiling mix of curiosity and carelessness coupled with being completely oblivious to the destruction and mayhem he causes further adds to the general chaos and bizarre shenanigans. Things tend to go instantly from bad to worse, as squirrels attack from their hiding place in the loft, cakes explode and penguins visit. Often I read reviews that say “laugh out loud funny” but I can say with confidence that the phrase “pink frilly knick-knacks” had be chortling like a good’un. It’s all in the timing, I’m sure. How could any child not enjoy this heady mix of stark-raving craziness and cartoon anarchy? Simply brilliant. Buy it.